Day 3 of the trip was a special one. 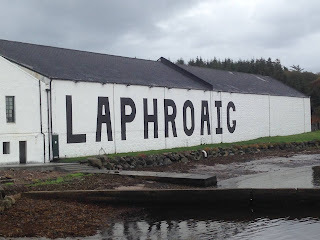 Laphroaig is one of my favourite whiskies and I had booked the most expensive tour of the trip there. The Distiller's Wares tour. Arriving at Laphroaig I was very excited and had a quick look in the shop and a wait in the lounge. I was doing the tour with 5 Belgian (I think) guys who were staying in the same place as us. David was our tour guide and he was fantastic. We started off with a quick chat about Laphroaig and where we were from and then went outside for a history lesson. 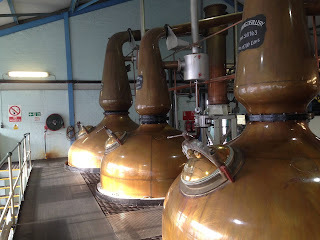 We then went on a detailed tour of the distillery. Laphroaig do their own maltings, so we started off there. Laphroaig can only produce 20% of their maltings on site. 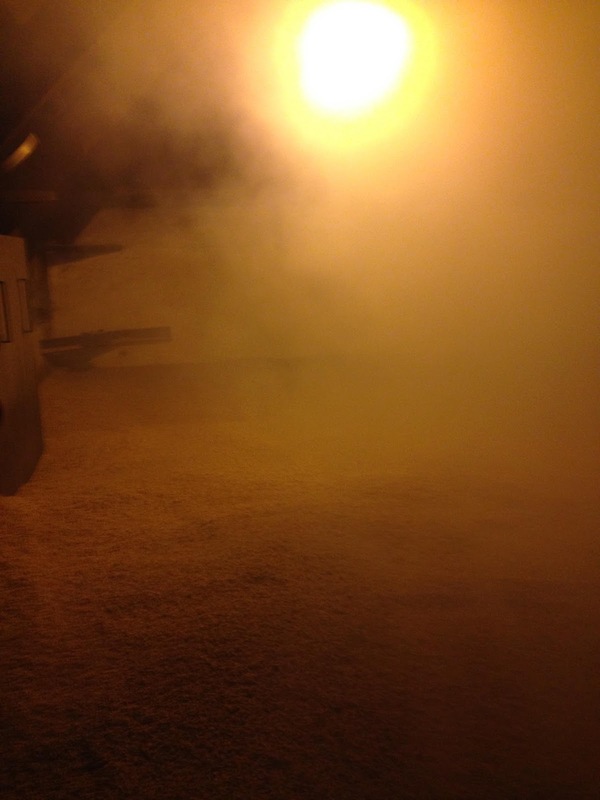 Because of the different floors we got to see the malt at different stages as well. So 50 hours steeping, then 6 days and nights on the malting floor of drying and soaking to germinate the barley. Then 20 hours of peating and drying over the kiln to an average of 50ppm. Laphroaig uses new steel washbacks, which was unexpectedly modern but the wooden ones are super expensive and only have a certain life expectancy. Oh well. We got to taste some of the wash and it was interesting to say the least. Like a smoky, very farmy beer. Interesting shaped stills with a narrow neck and an ascending lyne arm. Add slow distillation and you should be getting a nice, light fruity spirit. Oh, hold on, it's Laphroaig, so nope. The low wines were very smoky and farmy with burnt hay, grass and ash. The 65% spirit itself was very similar but more intense. We then went over to the No.1 warehouse right by the sea. Where we got to taste whiskies straight from 3 different barrels. Then got to bottle our own straight from our favourite barrel in a 25cl bottle. Info: Makers Mark bourbon barrel 5167, Vintage 1999, so 16 years old. Stored on the top rack of warehouse 11. Water: More citrus- Lime, lemon and orange. Taste: Intense, big sweetness, vanilla then building smoke. Quite floral with Heather and lavender. Water: Some spicy pepper and ginger comes out. Lime after a bit. Finish: Medium/Long length. Iodine, Flint with some honey. Info: Makers Mark Bourbon barrel 47, Vintage January 2004, so 11 years old. Stored in warehouse No.1. Nose: More fruity, loads of citrus, lots of rotting seashore- Kelp and seaweed. The sea has really gotten into this one, but it's balanced and interesting. Water: Vanilla sweetness, great smoke, great seashore. Great balance. Great. Finish: Medium/Long length. Citrus, kelp and smoke with some pepper. Info: Makers Mark Bourbon barrel recoopered into a 125L Quarter Cask, No. 2532. Full maturation from 2007, so 8 years old, but should taste older. Nose: Full, fresh and very fruity. Huge orange, vanilla, fairy cake and banana. Water: More banana, banana bread and more lemon. Taste: Sweet arrival, going even sweeter. Orange, little marzipan, lemon and lime. Only a little smoke with ash. Water: More seaside, kelp, seaweed, more orange, more marzipan, MORE. Finish: Medium/Long length. Sweet orange marzipan with some ginger spice. With water: More sea salt and spice. The 1st barrel was maybe a little too spicy and the 3rd a little too sweet. So I went with the 2nd barrel for my 25cl bottle, with its interesting seaside flavours and good balance. After bottling my bottle and signing for it we went back to the shop. I was surprised that they only really had the 10yo, the triple cask, the 15yo and the 25yo. In the end I decided to try the 15 because I'd heard good things. Nose: Really sweet, artificial sweetness. Melon, watermelon, mango, a little cinnamon. Taste: Watery start then fruit- Lemon and watermelon with smoke going into the finish. Finish: Short/Medium length. Lemon and some peat smoke. Notes: Easy drinking with very little smoke. Then I turned my attention to the 25 year old, making a bit of a show of looking at the bottle, picking it up and humming and hahing. I then asked what the woman on the desk thought of it. She said if I was serious about buying a bottle I could try it. Nose: Light, ethereal and fruity. Mango, some cinnamon, lemon citrus, wisps of smoke in the background. Great balance. Water: More sugary with vanilla sweetness. Quite tropical. Taste: Intense, fruit and vanilla combo, mango with a smoky backbone. Very light for Laphroaig with spices coming in- Cinnamon, some ginger. Great balance again. Water: Softer arrival, building tropical fruit and spice with a little background smoke. Finish: Long length. Tannins with soft fruit and smoke. Notes: 50% 2nd and 3rd fill Sherry with 50% Bourbon. I was a little disappointed with the 25, I was expecting it to score in the 90's and be the best whisky I'd ever tried, but I was really struggling to find the beloved smoke. However, I'd had a lot of cask strength Laphroaig before that, so may have been that. With more smoke it may well have been in the 90's. Next up: Part 3 Lagavulin and Ardbeg.